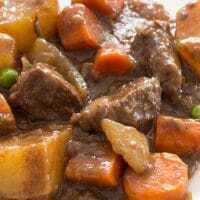 Slow Cooker Beef Stew is one of my absolute favorite meals to cook when the weather turns cooler. It is easy to put together and the smell coming from the kitchen reminds you there is going to be something yummy served up. 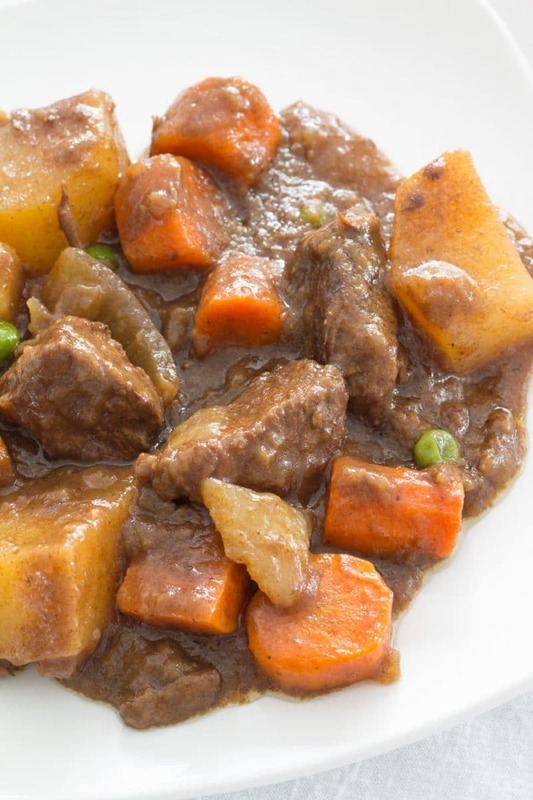 Beef stew is fairly adaptable too. I stick with the traditional potatoes, carrots, and peas because that’s what I like. Sweet potatoes, parsnips, rutabagas or any other sturdy vegetable could be added. I do not use any tomato base in mine, but feel free to add it. I prefer the pure beef flavor that shines through without it. 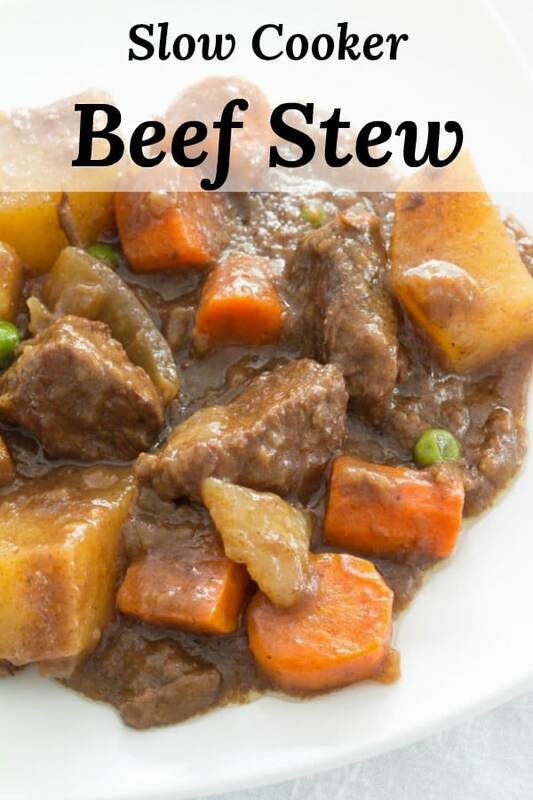 Now, I know that beef stew is supposed to be the complete meal in a pot and already has a starch. I also know that plain butter grits are usually served at breakfast. But I love to eat grits with my beef stew. When they gravy from the stew gets mixed into the grits, it becomes creamy goodness. Another breakfast food, biscuits, makes an appearance on these nights. Lines get blurred between breakfast and dinner here. We eat a lot of breakfast foods for dinner, especially egg bagel sandwiches and clearly I mix up breakfast foods with my dinners. When I am not being lazy, honey-butter will also make an appearance with the biscuits. 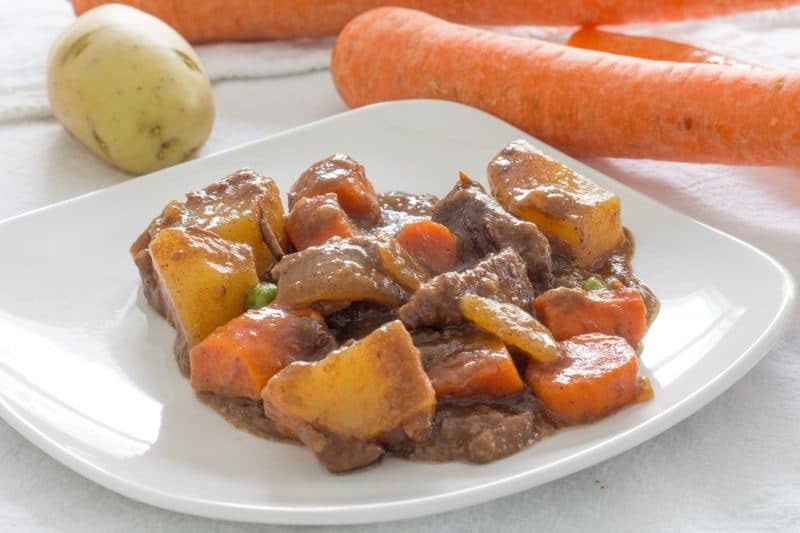 Slow Cooker Beef Stew can also be turned into an Oven Beef Stew cooked in the oven, just turn the oven to around 300 degrees F and use a lidded oven-proof pan. Cook until the meat is tender, about 4 to 6 hours. I have also simmered this on the stove top. When cooking on the stove top, make sure that it’s cooking at barely a simmer at the end, or the potatoes will turn into mush. 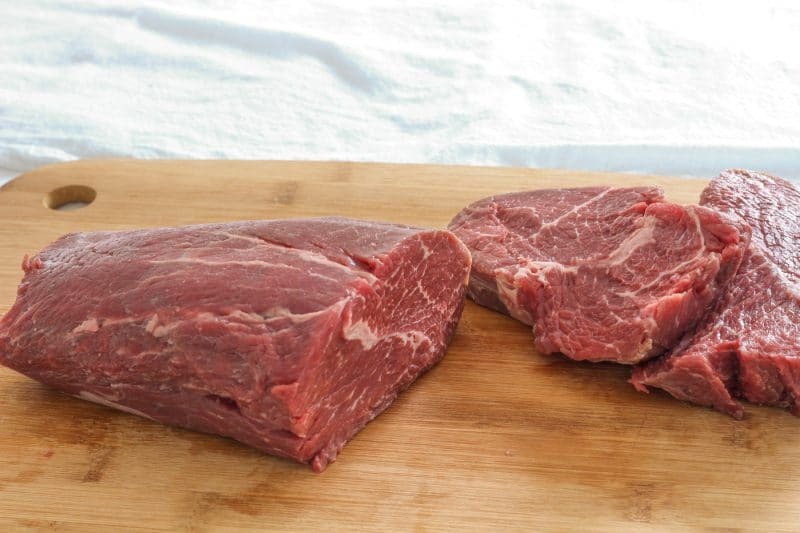 For the deepest flavors, allow meat to thoroughly brown during the initial preparation. All of the browned bit of flour and meat juices will add a ton of flavor. I do not have a favorite kind of meat for Beef Stew but find myself using chuck tender roast quite a bit. I tend to buy whatever kind of roast is on sale. Eye of Round has a tendency to become stringy though. It will work, but I will buy stew meat if available before I will buy an eye of round roast. 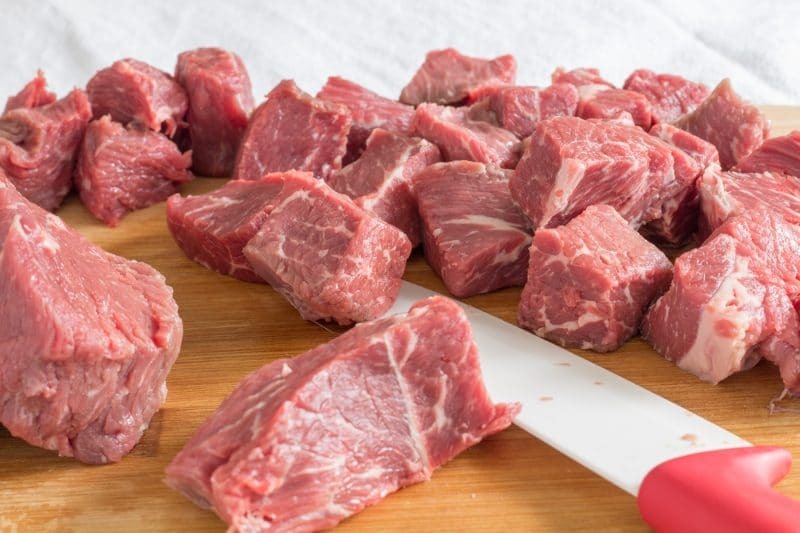 Make sure that if you begin with a roast, that you cut the meat into pieces that are close tot he same size. 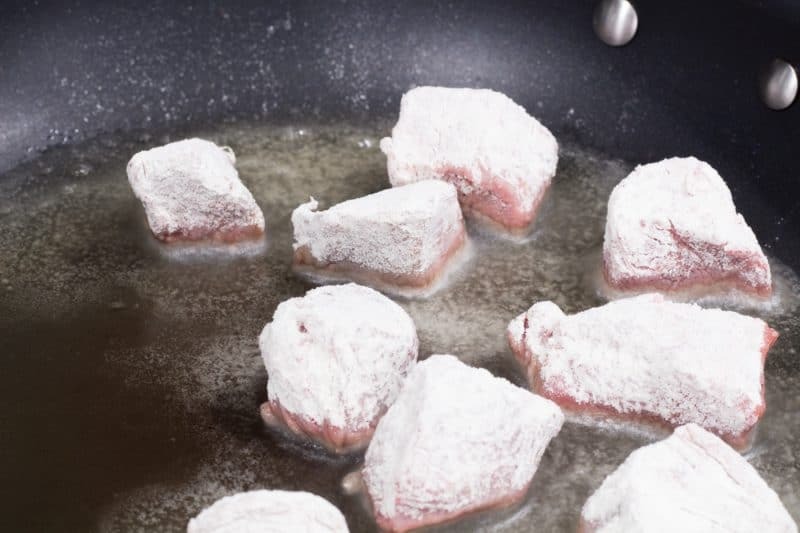 You can coat your meat with the flour, salt, and pepper mixture by tossing it all together in a bowl. Clean up is a ton easier though if you use a baggie. Just add the flour, salt, and pepper, to the bag and shake it up to mix well. Add the beef cubes, seal the top and shake the meat around in the bag. You may have to reach in there and separate a few chunks. You can either just coat them by hand inside the bag or seal it up and give it another shake. Before placing the beef into the hot oil, shake off any excess flour. 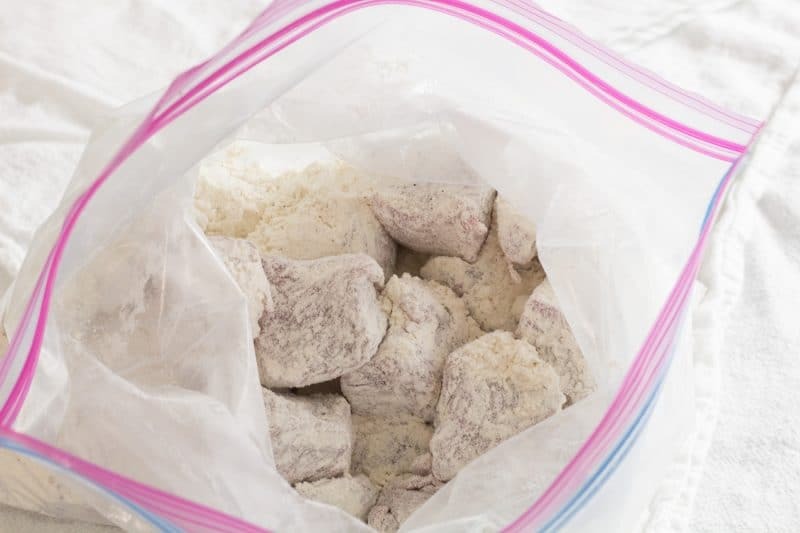 I usually just take a few cubes of floured beef and toss them between my hands over the baggie. 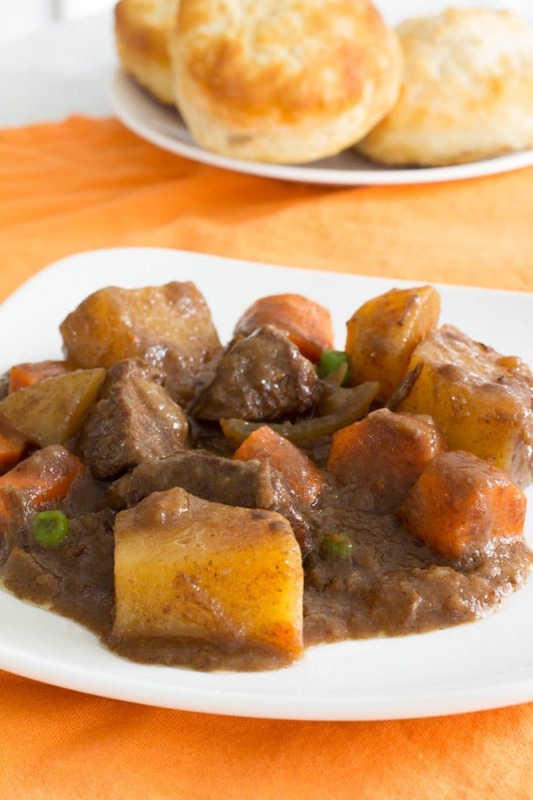 Traditional Beef Stew recipe with no tomatoes or tomato products, just a rich brown gravy that can be adapted to your own tastes. Place flour, salt and pepper in a plastic bag. Seal bag and shake to mix. Open bag, place stew meat into bag. Reseal bag and shake to coat beef evenly. Place a large skillet over medium-high heat and add enough vegetable oil to coat bottom of skillet. Add meat to skillet and cook, stirring often, until meat is browned on all sides. 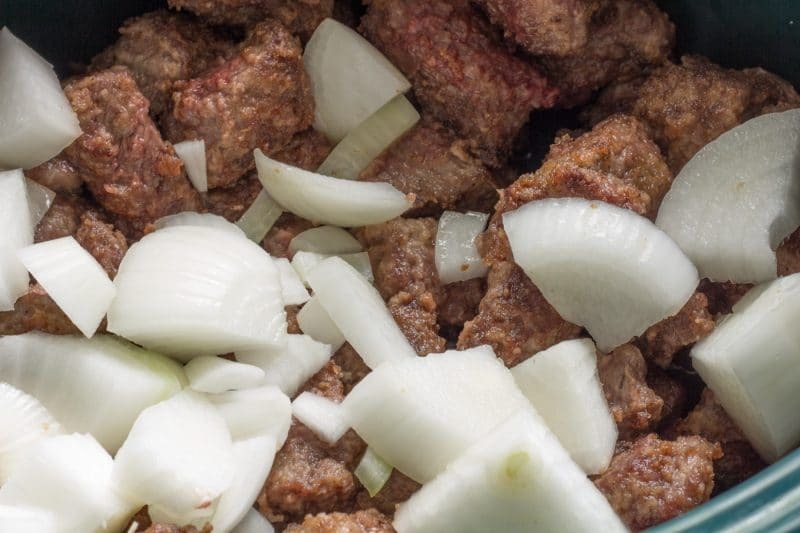 Removed beef from skillet and place in a slow cooker or in a large pan with a lid. Add the beef broths, Worcestershire sauce, and Beefer Upper. Cook on high in slow cooker for 4 to 6 hours or until meat is tender. Or preheat oven to 350 degrees F, cover pan and cook for 4 to 6 hours until meat is tender. Add vegetables to slow cooker or pan and stir to combine. Replace lid and continue to cook until vegetables are tender. This may take 45 minutes up to 2 hours. Cooking time will depend on the size and type of vegetables. Cook time provided includes 4 to 6 hours of unattended simmering time.